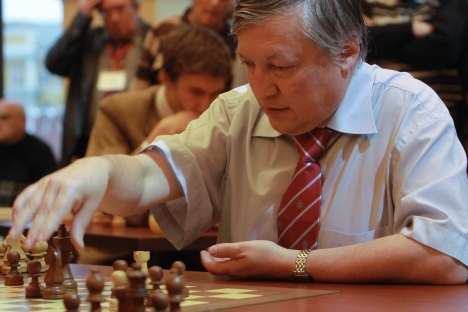 A group of State Duma deputies has charged the Ministry of Justice with launching a probe into the work of a charity headed by their colleague, three-time world chess champion Anatoly Karpov, to find out whether he is a foreign agent acting in the interests of a foreign state. Three-time world chess champion and current State Duma United Russia Duma deputy, Anatoly Karpov, is suspected by his colleagues of lobbying on behalf of tobacco companies and, thereby, failing to comply with the law on nonprofit organizations. Nine deputies have asked the Ministry of Justice to investigate claims that the International Association of Peace Foundations, chaired by Karpov, is financed from abroad by Japan Tobacco. Karpov’s colleagues said they were concerned about the former champion’s proposal to amend the anti-tobacco legislation and abolish penalties for the illegal sale of cigarettes. The letter was sent to Minister of Justice Alexander Konovalov on Jan. 18. Duma deputies point out that the International Association of Peace Foundations is the founder of the Peace and Harmony charity, which is a partner of Japan Tobacco, Inc. The Japanese company is the world’s third-largest tobacco producer and trader. It operates several production facilities in Russia and produces cigarettes under the Peter I brand. For this reason, Karpov’s colleagues have accused him of being a foreign agent. Deputy Dmitry Nosov, head of the inter-faction anti-lobbyism group, told Izvestia the move was prompted by a list of amendments that Karpov proposed to the anti-tobacco legislation. “These amendments loosen the version of the law approved by the government and are at odds with international agreements signed and ratified by the Russian Federation. Also, some of the amendments proposed by this [Duma deputy Karpov] encourage the production of counterfeit cigarettes and illegal sales,” Nosov says. Karpov’s colleagues were particularly outraged by his proposal to exclude the article on the prevention of illegal trade in tobacco products and tobacco goods (article 17), which envisages mandatory records of production volumes, monitoring of tobacco flows and distribution, and efforts to suppress illegal trade and liability for counterfeit products illegally imported in Russia. United Russia Duma deputy Yelena Arshinova believes the anti-tobacco coalition in the State Duma to be quite strong, justifying the need to investigate anyone, whatever their faction, if suspicions of lobbying arise. “The purpose of our address is to check whether the organization run by [Duma deputy Karpov] is a foreign agent, whether it receives financing from abroad and whether it is involved in the political life of the country,” says Arshinova. Karpov said the accusations were far-fetched and, for his part, accused his colleagues of being too emotional and quick-tempered in their hurry to hurl such accusations. “There is a simple explanation why I proposed to exclude article 17," Karpov explains. "Article 17 will make no sense once we ratify the protocol, because it is already in the protocol. The Duma committee decided to leave it unchanged and support it. The committee and the Duma are entitled to do so, but I don’t think it is right to adopt a law and then start thinking about amendments." “What is happening is an attempt to shift focus from a very serious issue to something unimportant," he added. "I proposed amendments, and if someone believes that I’m wrong, they should just turn them down. Let’s send everyone with stupid amendments to a mental institution for a checkup." Political analyst Aleksei Vorobyov notes that Karpov’s opponents, champions of the anti-tobacco law, are not exactly altruistic. “Those backing the anti-tobacco law are very well-motivated," Vorobyov said. "They are hurrying to push this bill through the Duma. At the very least, they are acting in the interests of the large retail chains by banning cigarette sales from kiosks." The Ministry of Justice has declined to comment, saying an official report would be made after the probe is completed. The anti-tobacco bill proposes banning smoking in most public places, allows only big stores to sell cigarettes (which will not be openly displayed), and introduces minimum prices for cigarettes. The story is based on materials from Kommersant daily, Izvestia newspaper and Argumenty i Facty newspaper (Arguments and Facts).